She worked in environments including canning, bottling, meat and poultry processing plants. To broaden her career options, Mary then pursued an Advanced Diploma in Travel, Tourism & Hospitality Management in London. "While I was studying, I supported myself by working part-time in restaurants, hotels and a hospital," she recalls. "The experience gave me a different understanding of how people related to food, and I learned to be disciplined, adapt to change, have a strong work ethic and to work well as part of a team." Having settled into life in the UK, Mary felt ready to study again, this time at Masters level. "I wanted to understand contemporary trends and technology in food, as well as the scientific theories that underpin the subject," she explains, "with the aim of becoming an expert in understanding the complex characteristics of food." Mary's research led her to our MSc Food Safety & Control. "Deciding to study again was a big decision for me, involving money and time," she says. "Every detail was important – the course and university had to be right, so I spent a lot of time looking into whether or not LSBU was the right place for me – and I was very impressed with what I found out." Once she had applied to the course, Mary decided to look into how she could fund her studies, and applied for the Frank Brake Scholarship. The scholarship, set up by LSBU alumnus and entrepreneur Frank Brake, is worth up to £4,000 and is available to students on our MSc Food Safety & Control course. "When I found out about the scholarship, I was truly inspired by Frank Brake's humble beginnings," says Mary. "We share the same values of quality, attention to detail, taking pride in all you do and giving back to those in need." Mary was disappointed to discover she would be out of the country during the week of the selection period, but she soon discovered that this would not be a disadvantage. "The panel conducted a telephone interview with me," she explains. "I really appreciated the lengths that LSBU went to give me a fair chance to go through the process, and the interviewers were kind and understanding, so I didn't feel nervous either." Even though the interview had gone well, Mary was still amazed to learn that she had been awarded the scholarship. "Words genuinely can't express the joy and gratitude I felt when I got the good news," she smiles. "There were tears, laughter and an incredibly strong sense of achievement." 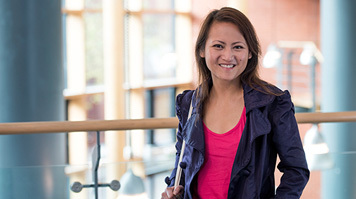 Although Mary was determined to undertake postgraduate study whatever it took, she believes that the scholarship will make things a lot easier for her, and help her to focus on her studies. "If I'd needed to work longer hours, I would have done so to reach my goals," she says, "but the scholarship means I can concentrate on my studies without having to worry about juggling too much work to support my education." It's an opportunity that Mary intends to make the most of. "I see my future as contributing to a multinational food company at senior management level, sharing my expertise and instilling the value of food safety and control into the organisation," she says. "I want to excel in my studies and make positive changes to society by improving food safety and increasing competition for the consumer. Thanks to Frank Brake and LSBU, I am one step closer to making that dream come true."